Grit Guard ® is the maker of car washing solutions that protect your vehicle while improving its appearance. The company’s primary focus is protecting your vehicle as it is being washed. This is when the paint is most vulnerable because loose contaminants can easily become trapped in your wash tool and rubbed into the paint. Grit Guard ® has developed several innovations to reduce the risk of scratches and make your detailing experience more enjoyable. At the center of the Grit Guard ® lineup is the Grit Guard Insert, a radial grid that sits in the bottom of the car wash bucket. The grid guard insert acts as a washboard: when you dip your mitt or sponge in the bucket, drag it across the grid to remove dirt and sand. The contaminants will fall to the bottom of the bucket and stay there thanks to the four quadrant design of the Grit Guard Insert. 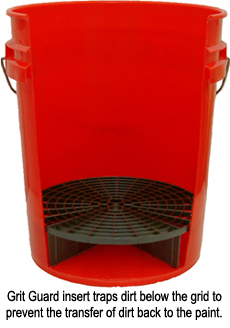 The four quadrants on the grit guard insert prevent the water at the bottom of the bucket from becoming unsettled so dirt cannot rise to the top. The car wash water stays clean and separate from the dirty water at the bottom of the bucket thanks to the Grit Guard Insert. Grit Guard® also developed a 5 gallon car wash bucket and lid, as well as a dolly, for the Autogeek, complete with our logo. All these items combine to make the Autogeek 5 Gallon Wash System with the Grit Guard Insert, a convenient, all-inclusive package for safe car washing. Choose from any of Grit Guard’s products or buy them all together in the car wash system. Grit Guard products will give you a safer, more comfortable and convenient car wash! Grit Guard Pad Renewing Solution 128 oz.